The water-side VHF communication system developed by Transas is intended to support communication between VTMS operators, sea port administration dispatchers and inspectors, river info service dispatchers, integrated situation centres, pilot service dispatcher centres, coastguard and other users requiring a reliable, multi-user VHF communication system. 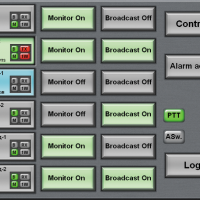 VTS Radio has a multi-user mode for remote-controlled radio stations, enabling expansion of the system coverage area and increased stability. This minimises the number of certified frequency resolutions as well as supplying extra functions (such as broadcast mode and integration with a VTMS system) for users. System log-keeping of all events with timestamps and registration of all audio calls. As a rule, audio switching units, the system server and audio registrator are installed at the standard telecommunication rack in the control centre server room. The operator sensor displays are connected via an existing or new structured cable network. VHF communication base stations are connected to the control centre via a telecommunication network (E&M-channels, IP, TDM, etc.). Each base station may incorporate any number of transceivers as well as extra channelling equipment, power supply systems and life support systems. The number of connected base stations is virtually unlimited.